Night Glow, an oil pastel, was one of those scenes that I couldn’t resist, so today I took some time to create this quiet place as we head into the weekend. A thin layer of Senneliers Mars Black was applied to Mi-Teintes black tinted pastel paper (8×10). I love this technique, because it allows me to establish a rich dark tone before I apply layers of oil pastels. The tools used for blending today were primarily my fingers and clay shapers, the oils in my fingers work to my advantage in smearing the OPs. A photo on pmp was my inspiration. 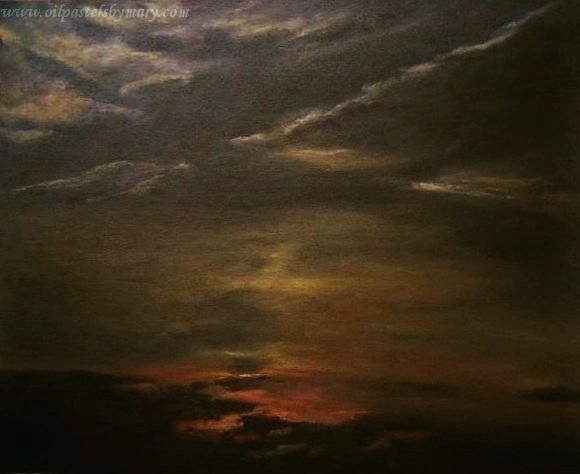 This entry was posted in About Oil Pastels, OPs New Paintings and tagged cloud, night, Oil Pastel, painting, sky. Bookmark the permalink. Thank you Nawfal for your lovely comment! Thank you Daniel, nice to meet you. I too tend toward brighter colors, but there is something very alluring about nighttime scenes, using black pastel paper and oil pastels – the OPs kind of make the scene glow. Thank you again! Such a lovely place. Quiet. Hope you are enjoying your weekend. Thanks Susan! Had a great one – hope you did the same. Very nice to meet you – thank you for visiting my blog and following. Appreciate your kind comment! A criss crossed kissed night glow .. how lovely ! What a great description Poppy – love it. Thanks and hope you are having a lovely Sunday. Thank you so much Cha! So funny M.R. and how big is the crate? Thank you – hope you are enjoying your Sunday! A peaceful weekend to you. Plus one thought…how do you keep your fingers clean? Thank you! Good question because with the black OPs or dark blues and greens my fingers can get pretty stained. I wash my hands a lot (that’s why they are so dry) but some artists will use a liquid to cover their hands (an invisible glove), others use latex gloves and most will use their bare hands like myself. Exactly what that painting does, makes me dream, calm down and feel peaceful. Lovely rich tones, that glow behind is sublime and visually very powerful, is just a strong magnet where my eyes are drawn into. Gorgeous night sky Mary, I love it. Thanks for making me slow down and dream away! Hi Eva, such a wonderful comment – love reading how the painting affected you. One of those scenes where it kind of lead me down it’s own path and I was along for the ride. The piece is actually quite moody in cloudy/lower light, when light touches the painting there is this glow that emanates and draws you in. Thanks so much – so glad you enjoyed this piece. Hope you’re having a nice weekend. Thank you so much for your generous comments – really appreciate it! Thank you, Mary for your thoughts. In the mainland it wasn’t felt that much. It was very near the North Aegean islands but not a lot of damage thankfully. Because we live in an high hazard earthquake part of Eastern Europe [where the plates meet!] we are ‘used’ to the earth dancing [if ever anyone can get used to that horrible situation!]. As a result however our building structures are strong in order to be able to …stay up so to speak! Unfortunately Turkey was not so lucky with this one as they were more affected and this comes just a few days after the miners disaster. Happy to hear that you are okay, I never think about earthquakes in your area. I used to live in San Francisco – the ground shaking was something I could never get used. So sorry to hear about Turkey and also of the mining accident – they have had a tough go of it recently, very sad. Lovely! We all need to take time to slow down and dream. Have a safe holiday! And thanks for the recent visit to my blog. Hi Jackie, thanks for your generous comments – this painting kind of took me for the “ride-along.” I enjoyed every minute of it. Wonderful weekend, packed with lots of yard work – that I love doing. So beautiful and realistic! I love it! Hi Mamie, thank you so much. I love receiving your feedback – hope you enjoy your summer break, looking forward to seeing new art pieces!